The global demand for accessible, high quality translation services has risen dramatically over the past decade or so. Whether you are expanding your business internationally, or connecting with new friends on the other side of the world, there’s no doubt that a reliable translation service makes the process much easier. One of the most widely available services of this kind comes in the form of automatic translation. This type of service is available from many popular companies such as Google and Babelfish. There are also some browsers which now provide users with plug-in options, which allow for language detection and translation services for every website visited though them. Even social media sites such as Facebook are offering people an automatic translation of comments made in a foreign language. These services are free, but of course one has to wonder about the translation quality; does the service provide enough accuracy for the translation to be of use? The answer to this question is not a simple, ‘yes’ or ‘no’. For those who simply want a basic translation of a short article, these automatic translation sites can be incredibly useful. They provide instant access to material which would otherwise be unavailable to a person who does not speak the language. Provided the person reading the text is just looking for a general introduction to the topic, then machine translation services are perfect. However, for those who require exceptionally accurate translation for the purposes of business or study, then the current automatic services may not be suitable. It’s important to bear in mind that the technology used to in machine translation is constantly under development and updates are regularly made to sites such as Google Translate in order to ensure they provide as accurate a translation as possible. One of the most positive aspects of machine translation is that is allows for the sharing of knowledge without the costs of hiring a professional translator. Those who cannot afford to pay for a person to translate an important document can now access that content free of charge, or for a very small fee, depending on what service they use. Automatic translation services are also ideal for those who want their emails and documents translated without confidentiality concerns. For instance, if a business owner wishes to have a financial document translated, hiring a person to provide this service could create certain privacy breaches, depending on the nature of the information in the document. This isn’t an issue when one uses an automatic translation service. Anyone who is running a company with international operations will know the importance of communication in creating a successful business. The same policies and professional goals of the company must be understood by all of the employees worldwide, regardless of the language barriers. For those whose business extends to multiple countries, automatic translations services can be invaluable, as they allow for the immediate translation of a document into any number of languages. Most human translators rarely speak more than four languages, and so may not be as useful to business owners who require instant translation of texts into several languages. User guides, offers, sales opportunities, reports, educational material, etc. Today a lot of information is shared in a PDF format. 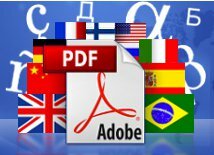 Multilizer PDF Translator translates those documents for you automatically. Get Your Free version here. It’s true that translation service makes the process much easier. Translation Services help in many Companies to communicate with other companies and help in teracting with people. Amazing post!